Supertuff provides a wide range of Glass processing services, for all sizes and shapes. All our #mirrors are high specification and can be cut to size, safety backed and processed to individual requirements. Specialists in the delivery of Glass and a Bronze accredited member of FORS. Deliveries can be made direct to sites on Certified ‘A’ Frames for Crane or Forklift off-loading. Selecting the right sealed unit is essential for ensuring that it meets the intended requirements of your project. Each product within our wide ranging portfolio has been developed to offer only the optimum in quality, functionality, performance and style. Through the latest innovations and clever technology, we have the capability to offer our clients the ultimate in comfort, thermal efficiency, sound reduction, safety and a great deal more. We are able to meet the demands of both the domestic and commercial marketplace through the supply of quality products supported by modern equipment and an experienced workforce. Our sealed units are created to our customers’ requirements dependent to glass type, gases options and decorative choice. Clarity uses modern glass coating technology to create anti reflective glass with reflection less than 1% and a light transmission of 97%. 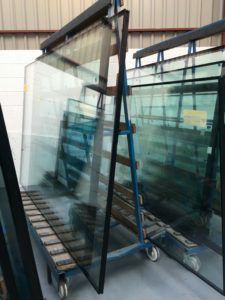 Guardian Clarity is one of the few anti reflective glass options available in sizes all the way up to Jumbo (3210 x 6000 mm) and in either single or double sided coating on either annealed or laminated low iron float glass. Guardian Clarity, an anti-reflective glass is the ideal product for any application where excessive glare of reflection creates an obstruction: whether it’s a shop window which loses impact due to distracting reflections, a viewing platform which loses visual accuracy due to distracting glare, or a restaurant with a breathtaking view which becomes completely hidden as soon as the sun goes down, anti-reflective glass provides the perfect solution. Common applications range from museum vitrines, display cases, shop fronts, car showrooms, restaurants, control towers, sporting facilities, zoos & aquariums.